The take home message of this study should not be that palliative care consults for ICU patients are ineffective and cause harm. As a community, we have a responsibility to make sure that's not the take away. First, a bit about what they did. The study was conducted by a terrific group of researchers, led by Shannon Carson, physician and chief of pulmonary critical care at U North Carolina, and also included Laura Hanson, James Tulsky, and Judith Nelson, among others. They randomized 356 surrogate decision makers for patients who were in the ICU and on a ventilator for 7+ days to a palliative care "support and information" intervention vs. control group. Both groups received a brochure about what to expect. The study was conducted at Mt Sinai, UNC, and Duke. You read that correctly, higher PTSD in the palliative care group. What, you might wonder at this point, did this palliative care "support and information" intervention team do in these meetings with surrogates?!? So why didn't it work? Why were PTSD symptoms WORSE with the palliative care intervention? "The intervention was not a full palliative care consult, which typically involves more frequent encounters with palliative care practitioners, active management of patients' symptoms, and involvement of social workers and chaplains." Exactly. 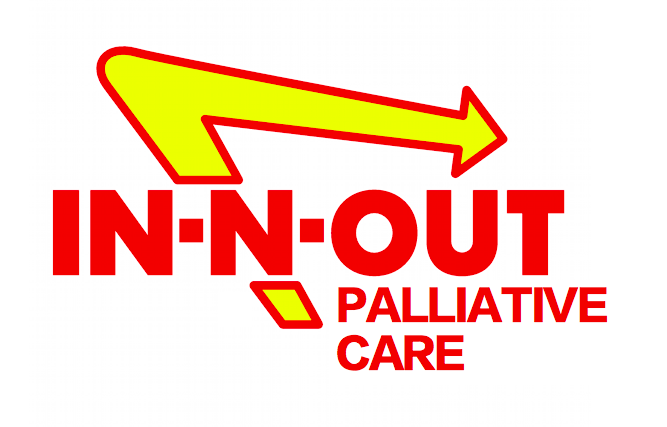 With all due respect to the outstanding palliative care clinicians at Mt. Sinai and Duke, these were not full palliative care consults. They were "In-N-Out fast food-style" palliative care consults (Google In-N-Out, East Coasters). An average of 1.4 encounters, and on the very first encounter you cover prognosis and goals of care? I do that every once and awhile, but my primary goals in the first encounter are usually (1) to introduce the idea of palliative care; and (2) to form a relationship with the patient or surrogate: Who are you? Where do you come from? How are you? I try very hard not to get into the heavy stuff of discussing prognosis until I know the person and have formed a relationship. I try to encourage people to involve palliative care early in the process, prior to 7 days on a ventilator, as a great deal of the important work (and sometimes misinformation) has already happened. And when I'm consulted about one of these patients, I work together with the ICU team, often meeting with family in conjunction with the ICU residents, fellows, attendings, social workers, and chaplains. I'm part of a team, and it's important for patients and family members to see it that way. In this study, the ICU docs hardly every saw surrogates together with the palliative care intervention group (less than 10% of the time). So yes, it's true that there is currently no evidence for routine brief palliative care consults with surrogates of chronically critically ill patients where you don't consult until after treatment decisions are made and goals established and only see the patient once and don't have a full interdisciplinary team or work with the rest of the ICU team. Fine. Palliative care clinicians, don't give up your day jobs! There's more research to be done here. Personally, I love this article. Your practice you outline above is really nice. But I've seen the drive-by consult in action. I've seen difficult prognosis discussion pushed very early. I've seen advance directives brought up with families were not even close to ready. As a consequence, I've seen palliative care be kicked out of a room never to be invited back. We need a more rigorous process of assuring a theoretic foundation to our work. There are many great communication theories out there upon which to test hypothesis and truly advance a field. The field has been more interested in growth than it has been in advancing science. Applause to these investigators for publishing what was "in the syringe" - thus giving you the opportunity to critique. My hypothesis, they would have had a different result if they had trained ICU docs how to have these meetings. People want to hear from their doctor. Oh, and I agree - the JAMA tweet was irresponsibly stupid. Nice JAMA. Thanks Alex - I think we all know how frustrating it is when something we all believe in gets tested in a "stupid" way and the whole concept (palliative care) gets blamed rather than the stupid implementation. However, we also need to admit that this kind of critique is more persuasive when it is issued in advance of the results, not after their release. We also need to think seriously about how we would react if the results of the study had been positive for the intervention. If we would have accepted a positive result without the critique of the intervention, we need to rethink as well. However, I think the most important failing of the study is in the simple binary design. Why did the investigators think that this particular implementation of a consult was worth comparing to a placebo? In drug studies, lots and lots of animal studies and some theoretical biological models provide the reason to test a particular compound at a particular dose/formulation. As I've argues on Health AGEnda, health services research needs a similar evidentiary and theoretical basis before an RCT is done on a particular intervention. Given that failure is ALWAYS an option, we need to be sure that failure is informative, not just confusing and disappointing. In basic psychological research, establishing a boundary condition (i.e., a limit on an effect), requires that you replicate the basic effect as part of the study showing the circumstances when it doesn't work. Otherwise, a null result is just too hard to interpret. In this case, the design should have replicated some previously demonstrated effect of palliative care at the same time as using this method on this population. Chris, that is a brilliant comment. Health services research in general - and (I would argue) palliative care HSR in particular have been very weak in elaborating the theoretical underpinnings of our work. This has made interpretation nearly impossible. This is really hard work and there's a lot to applaud the authors for. I really hope that this trial - as a negative trial that will get interpreted very broadly (as JAMA has already done with their tweet) - is the one that pushes us to be introspective about the science. Team science with a mix of clinicians and PhDs is hard, but is perhaps the best way forward to marry the theory with the clinical realities. Just to clarify - I did NOT actually lose my job over this paper! Many thanks for those of you who have reached out with support. Dan - well it's sad to hear the drive-by palliative consult is alive and kicking. I don't believe the clinicians at Duke or Sinai would consider these normal palliative care consults. Probably shouldn't have used the word "palliative" in the manuscript other than to say the clinical was a palliative care physician. They tried to constrain themselves in the methods using the term "information and support sessions", but failed to do so in the set up, discussion, and (importantly) title. Chris - I like your idea (or psychology research's idea) of replicating past findings as part of the study. IN a way, I wonder if that was the intent of everyone getting the brochure. A NEJM study they discuss also used a brochure (in France) in the ICU, but that was a different population (at the time of withdrawal of life-support). Good feedback for future researchers in this field. What if this was positive? I would also have been surprised, frankly, that so little of an intervention led to significant changes. Dan - appreciate you bringing up the Temel study - I think there's been a lot of sloppy thinking and frankly intellectually dishonest public discussion coming from that study. It was a great study, and super interesting, and I'm enjoying the early findings from the f/u study (it's in this year's asco abstracts), but I used to get very uncomfortable, and now just get angry and start really, really judging people who present the study as unqualified 'proof' that pall care interventions prolong life. I still see that happen all the time. There was also that modestly interesting but low-level-of-evidence study suggesting that hospice patients live longer in hospice than their non-hospice counterparts, I can't remember the reference now, but i've seen it's findings misrepresented all over the map and it slays me inside. Stupid stupid stuff. So we're guilty of that. Anyway, I came here to say to Sean: Best Comment Ever. Thank you. You make some wonderful points here, and I am glad to see interprofessional practice highlighted with mention of, for example, chaplain. As a social workers, we are taught to "meet the client where they are", which fits well with palliative care. Yes, there is a point when prognosis should be discussed, even if that is "pushing" the family some, but there are times where we in medicine over-hammer the nail, hitting our patients and families over the head with bad news. As well, there are times we try to hit that nail with a feather, being over-gentle. It takes time to build to the state of a conversational Goldilocks and it takes a team to get there. I cannot seem to find any information in this article about how many family meetings the usual care arm had. Just the statement that "ICU clinicians managed all formal and informal family meetings per their usual practice." There is discussion about extra meetings that were had in both arms but it isn't clear how those differed from the other meetings (or whether these were formal or informal, which by the way what exactly is the difference?). Perhaps there was not a difference in stress because there was less time spent addressing stressful subject matters in a stressful way in the control arm? Am I just missing where this might be? Hi Ryan - Is this what you're looking for? A mean of 1.9 family meetings was conducted independently by the ICU teams for families in the intervention group after randomization that were separate from the support and information team meetings; however, this was not significantly different than the number of family meetings (mean, 2.1 meetings) conducted by the ICU teams for families in the control group (between-group difference, −0.2 meetings; 95% CI, −0.6 to 0.2 meetings). I thought that the researchers categorized the 2.1 meetings of the control group as being similar to the 1.9 extra meetings with the ICU team in the intervention group--not the 1.4 "palliative care-led" meetings. The wording is unclear. It seems like it would make more sense to compare the total number of meetings between groups (3.3 for intervention and 2.1 for control) or the baseline number of meetings (1.4 for intervention and 2.1 for control). I don't understand why they are performing a statistical analysis of just the number of meetings that the ICU team participated in. It seems like a worthwhile variable to address. Why would the intervention group need so many additional meetings? Why did the control group appear to need fewer to achieve similar results? Why am I still asking rhetorical questions?! Anyway, thanks for the response and the great discussion about this study. Also curious to know how many people in either arm had a traditional palliative care consult placed at some point in their hospital stay.